FAQ: What tank can I place in my basement for rainwater collection? Question: I am looking for a 1000 gallon rain water tank that I can use as a replacement for my old, leaking cistern. I am not sure if there are cistern liners or tanks, but I require one that can fit in my basement. What are my options? Answer: Thank you for contacting us! For rain water collection and storage, the best option would be the 1000 gallon Rain Water Tank. Flexible tanks are designed to replace cistern liners or be used on their own in a crwal space, underneath a deck, or in a basement. Collapsible tanks can be made to almost any storage capacity. The 1000 gallon model is approximately nine feet long, eight feet wide, and two feet high (9' L x 8' W x 2'	H). Flexible tanks can be built to custom dimensions to fit inside existing cisterns, within footprints of foundations, and underneath porches or crawl spaces. We can also customize the fittings to match your existing plumbing for a flawless installation. 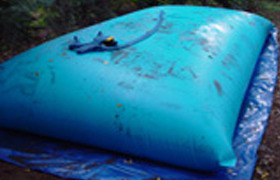 Learn more about other sizes and types of flexible pillow tanks for water storage. The collapsible tank for rainwater collection and storage is one of the most flexible and durable options available. These tanks include fabrics that contain an NSF 61 and FDA approval so you can safely use this tank for potable water, if so desired. Fabrics: The available fabrics for this cistern tanks include materials that are FDA and NSF 61 approved. This allows for the safe storage of potable water. Fittings: These tanks are often made with various fittings that allow tanks to connect to hoses and pipes. Standard fittings measure 3/4" through 2", with several larger models available upon request. Flexible in both design and storage ability, these tanks have often been placed directly into a leaking cistern to several as a kind of liner or dual water storage system. This helps to decrease installation and setup times by allowing you to modify any existing tank storage design. In addition to the 1000 gallon rain water tank, we do also offer cistern liners that can be placed along the inside of your tank to help prevent leaks in an old storage unit. Similar to our storage tanks, these liners are also made from an NSF 61 and FDA approved material to stay in compliance for potable water storage.